Image Edit gives you all the drawing tools you need plus many of the best photo effects available anywhere. 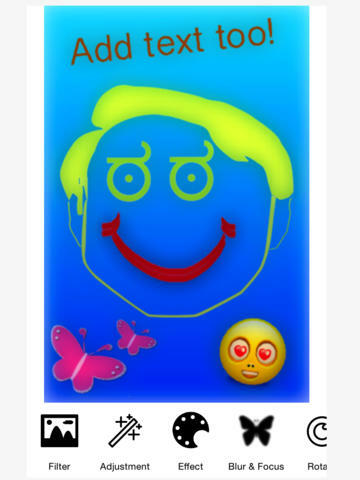 Take a picture with a pencil or Cartoon effect, add a emoji sticker, crop an image, add text - this app has it al! This app lets you draw over a new photo you just took with your camera or any image saved in you image library - but that's just the start. You can also add cool image effects and turn your photos into a cartoon or a glowing florescent work of art! 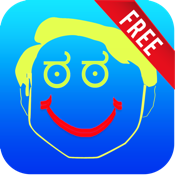 Crop, add text, rotate, add stickers or emoticons, resize - pretty much whatever you want to do, you can do it with this app! You can add drawings, stamps, text, cutouts and other fun things. The app allows you to start with an image from your library or start with a blank canvas then tweak it with text, one of 200 different stamps and stickers, more images and other fun add-ons. You can draw on your images as well as crop and erase - whatever you want to do - you can do it with Image Edit.